U.K. 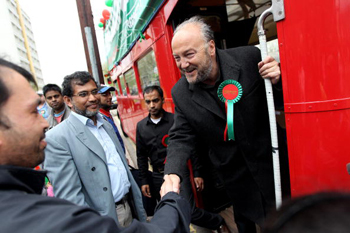 Member of Parliament George Galloway was denied entry into Canada in the spring of 2009. Mr. Galloway is now embroiled in a court case with Canadian Immigration Minister Jason Kenney in Canada to win the right to enter Canada. Am Johal caught up with him while he was on the campaign trail in the United Kingdom. Q - How is the U.K. election shaping up? What do you make of the choice between Labor and the Conservatives? Tories. … But really it has all been based on style rather than substance. All three are promising savage cuts, although, to the credit of the Lib Dems, they want to scrap Trident and provide an amnesty for illegal immigrants. My campaign in Poplar and Limehouse has been roaring along, principally from the top of an old, red, open-topped London bus. The reception has been fantastic, better at this stage than it was at the same point five years ago. Q - Who do you think will be the future leader of the Labor party? Well, do they play safe and traditional, in which case it will be Alan Johnson, the home secretary, who is close to the unions? He's a former postman. Or will it be one of the Miliband brothers, David or Ed? Dave is the foreign secretary, and his wee brother Ed is in charge of energy. The former was close to Blair, the latter to Gordon Brown, although I bet neither wants anything to do with them now. I think it will depend on how badly Labor do in the election as to how radical they want a shift in leader to be. Q - Jason Kenney seems to be using the CBSA's evaluation system as an excuse not to intervene in your situation. As a sitting member of Parliament, Canada just might be one of the only countries in the world that would deny you entry, as if they can't draw out the distinction between an activist and a terrorist. What do you make of this mode of logic that the right seems to be obsessed with? Velshi, who actually phoned up the British tabloids to tip them off before even contacting me or my office. It was more than eight hours after the Sun published the story that I was contacted officially. The emails and letters we have obtained through the disclosure process demonstrate the great lie vividly, as rabble.ca has brilliantly uncovered. The latest batch of papers shows that even your security services were against the ban. I guess we shouldn't be surprised that Kenney—who has described himself as a "Catholic Zionist"—and the rabidly pro-Israeli Velshi should have come up with this while allowing Ann Coulter into Canada, the woman who advocates carpet-bombing Muslim countries. Q - When do you hope to make your next visit to Canada? As soon as we win our case we'll set up a tour—the "As I was about to say before I was illegally interrupted" tour. So I would hope to be there late summer or early autumn. I'm looking forward to it keenly. Q - What would you like to communicate to the Canadian public? I've been to Canada many times and I've always found the public open and fair-minded. I don't believe they share the dangerous, hysterical reasoning of Kenney and Velshi. Canada used to be a by-word for honor and dignity in the world, not narrow-mindedness and bigotry. Your soldiers have been vital to peacekeeping in many countries, and I am sure that these days will return. I'm grateful to Canadians right across the political spectrum who have communicated their support to me. I value that greatly.